I'm heartened to know that Robert Redford is as disgruntled with press junkets as I am. That's as much of an indirect confirmation as I need. Rather than subject his new film Lions For Lambs to the tailored and predictable questions that would inevitably haunt the hotel suites that usually host such press junkets, Redford has opted to screen the film for university audiences and to engage their questions. He genuinely wants to know if his critique of student apathy is accurate or not. Thus, he accompanied the film to a screening at the Shattuck Theatre in Berkeley, California—once the hotbed of the activist Youth Movement in the '60s—to explore if young people still have some bite left. Lions For Lambs braids three accomplished performances by Redford, Meryl Streep and Tom Cruise, with fine supporting turns by Andrew Garfield and Michael Peña, who accompanied Redford to last night's stage. Redford plays an idealistic political science professor; Streep a compromised journalist; and Cruise a senator and presidential hopeful whose eyes gleam with the dream of military victory. Sound familiar? It should. But where Redford ratchets up the familiarity is in how he articulates the ideas that inform the film's action and his stern caution that "if you don't stand for something, you might fall for anything." 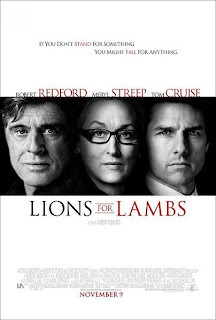 Michael Guillén: Robert, Lions for Lambs is very much a movie constructed from clearly articulated ideas that seek engagement with the film's audience. Often with films, light and focus is placed on answers; but, here, questions take center stage. It's well-documented that the Iraq War—in contrast to wars before it—has seen an unprecedented preponderance of coverage, first through (as the film suggests) how the media sold the war to the American public, then through a rush of documentaries from the field, and now with an increasing appearance of fictionalized features. Just as too much information can distract from grasping the issues at hand, I fear entertainment can become commensurate noise, further distracting audiences from the very topics the films seek to address. My question to you is: What was it in this script that you felt served the topic and would leap over the hazard of entertainment as noise? Robert Redford: I never wanted to make a film about the Iraq War because I felt even a year ago that that was going to be treated heavily, either in documentaries or films. I just knew there was going to be a lot of films about the Iraq War. I was not interested in making a film about the Iraq War. What captivated my interest in this was that it was a tryptich of three stories that would try to find some way to connect and would connect on a much deeper level than you might think. That's not easy to pull off; but, it was challenging and interesting to me and I thought, well, if I was going to want to make a film about where we are today—I mean, there are other films I made in the past that were about where we were at various times—it would be … since globalization has occurred and borders have dissolved and lines have dissolved, things are overlapping into each other, the idea that education and politics and the media are overlapping each other with versatile stories, with the catalyst being the soldiers Michael Peña and Derek Luke play in a dire situation that is a result of decisions made by higher-ups who are not qualified and are interested in winning only. To me, that covers a broader territory. That's what got my interest. It was not about the war. It wasn't even about the issues. It was about those three categories being caught up in this situation and about everybody's self-interest. Because it is a very self-interested piece; everybody has their self-interest. I think we all do because we're trying to survive. That's what interested me.